Goldfish have been domesticated for around 1,000 years. They’ve been domesticated longer than any other fish species. Through the years around 20 breeds of goldfish have developed from the strange, dorsal-less celestial-eyed goldfish to the elegant shubunkin. The most common goldfish you will encounter in the hobby fall into two categories: single-tail (which I often call commons) and double-tail (which I often call fancies). Here are two examples below. For the rest of the article I will be grouping the goldfish into these two tail groups to define the different care requirements for each. Another category of goldfish that needs mentioning are the sight-impaired goldfish; this includes the bubble-eyes, moors (or dragon-eye), and the celestials. These are generally some of the most sensitive goldfish. It is best to keep them with only other sight-impaired goldfish. Due to their eye shapes these fish are often slow swimmers and will have trouble feeding and competing for food even with some of the other double-tailed goldfish. Before I talk about the care requirements, I should say something about goldfish size. There are a lot of misconceptions about goldfish, one being that goldfish stay small. This is absolutely false. Fishbase.org places the average goldfish length at 12 inches (32 cm). The fish you often see in the store are babies probably no more than a month or two old. Make no mistake. They will be monsters in no time with proper care and food. 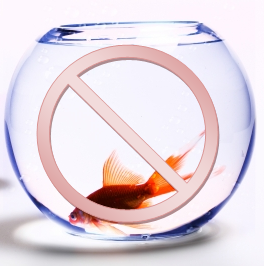 No matter what the sales associate tells you or how your friend was able to keep them, a bowl is not a suitable home for a goldfish! They are often less than a gallon and don’t provide enough surface area for oxygen to diffuse into the water. In fact, a fully grown goldfish couldn’t even fit in a bowl!! At minimum your tank should have 10 gallons (40 L) for each fancy goldfish and an additional 10 gallons (40 L) as a buffer zone. For example, if you want four double-tailed goldfish you are looking at a minimum of a 50 gallon (190 L) tank. Single-tailed goldfish need room as well as gallons. They are fast and like a lot of swimming space. For one single-tailed goldfish you will need a 75 gallon (285 L) tank. A 125 gallon (475) is well-suited for a small group. With their large size and large swimming area needs, they make much better pond fish than aquarium fish. I know some of you are thinking that if the pet store can cram hundreds of goldfish in a tiny tank, why can’t I? You should not base your fishkeeping habits on pet store displays. The fish are usually only there for a short time which is why the stores can get away with minimal decorations and no plants. It’s the difference between a hotel room and your bedroom. Wouldn’t you feel more comfortable in something personalized to your liking rather than generalized for everyone? A common misconception about goldfish is that they are coldwater fish. This is untrue. They are temperate fish. The largest difference between a temperate and tropical fish is that the tropicals have a steady, high temperature year round while temperate fish have large fluctuations from close to freezing to around 85F (30C). All this means is that goldfish can live at a wider range of temperature than most fish commonly found in the hobby. As I mentioned before single-tails and double-tails have different requirements in this department, too. Due to the more sensitive nature of the double-tails they are best kept at temperatures between 70F (21C) and 80F (27C). This may mean that your goldfish need a heater if the tank is in a colder area of the house in the winter time. Single-tails are hardy enough to withstand pond life year-round and will survive at temperatures close to freezing and as high as 95F (35C). If they are kept in an aquarium no heater is needed. They can be overwintered inside if the pond is too shallow, but the aquarium must be large enough for them. A 50 gallon (190L) is a good size. This is the most important aspect of having a goldfish. Clean water means a healthy fish. The best way to tell if your water is clean (nope clearness doesn’t count) is to have a home test kit. The drop kits are the best; the strips are just a waste of money. In a goldfish tank the ammonia and nitrite should ALWAYS be 0 ppm. Nitrate can be hard to control because goldfish are so messy, but we aim to keep it under 40 ppm. The next set of parameters you have to worry about is pH and water hardness (GH and KH). Goldfish may be hardy, but they still have needs. The pH should be above 7. Between 7.2 and 8.2 is ideal. While it is not always necessary to know the exact numbers of your local water hardness, it is important to know that goldfish like hard water which is water with a high mineral content. Their protective coating called a slime coat will slough off in soft water. The only way water quality is maintained is through weekly water changes. There are some older aquarists who will say this is not needed; that line of thought is outdated. All of the current fishkeeping resources recommend weekly water changes. Because goldfish are so messy the weekly water changes should be about 40% to 50% of the tank volume. This means for a 50 gallon (190 L) tank you should take out and replace between 20 gallons (75 L) and 25 gallons (95 L) of water a week. Filtration is another important aspect of keeping good quality water. 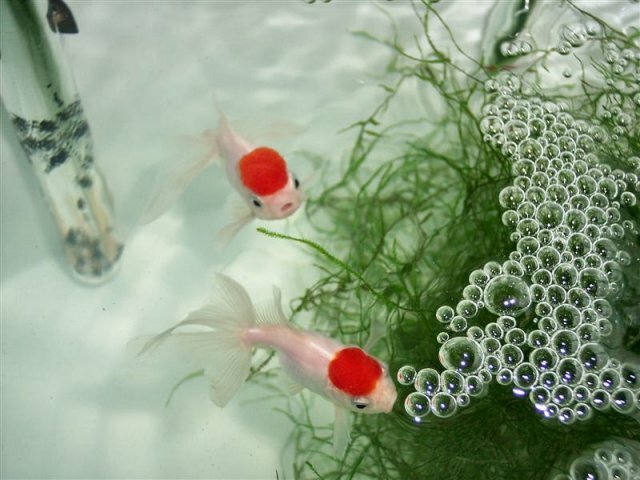 A filter than can turn over the volume of the tank 10 times per hour is recommended for goldfish. This can also be accomplished by running two hang on the back (HOB) power filters. I am using this method with my 50 gallon (190L) goldfish tank. Filter brands vary depending on what part of the world you are in, but in the US I have found the AquaClear brand filters to be very reliable. Water quality has the largest impact on goldfish health, but without a good diet, your fish won’t reach his or her full potential. A high quality food should be used as a staple diet. New Life Spectrum is currently the best pellet food around. And you don’t just need to buy the stuff labeled for goldfish. Any of the diets will do; just make sure they fit inside your goldfish’s mouth and are not floating. 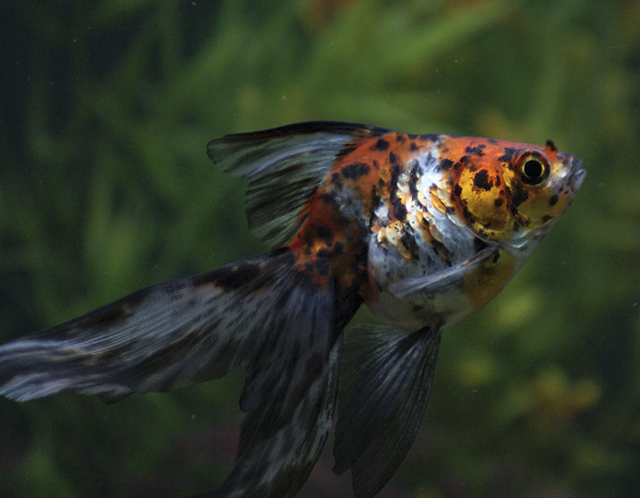 Due to the body shape of fancy goldfish, many experience gastro-intestinal problems associated with pellet food. When this happens, you should switch to gel food. Mazuri gel food is the best commercially available, but many goldfish keepers chose to make their own. It is much more cost-effective and can easily be personalized for the individual fish because like us, some fish don’t like certain foods. It can also be an interesting way to bond with your fish. This is something most people don’t think about, but watch your goldfish for a little while. They spend a lot of time picking at the substrate and really anything else in the tank. It is important to have a substrate that is either too large to fit in the goldfish’s mouth or small enough to pass through their system if it does get swallowed. I use large river rocks (from a store not the creek as items intended for aquariums have undergone a sterilization process) but have seen other keepers use sand. There are also keepers who have used regular aquarium gravel and never had a problem, but there are confirmed cases of gravel getting caught in the GI tract and killing the goldfish. It is at your discretion as to whether or not you want to take the risk. Goldfish are a very social species and should be kept in groups of 3 or more goldfish, but there are some compatibility issues between the single-tails and double-tails. The single-tails are much faster swimmers and more boisterous and for these reasons, should not be kept with double-tails. When looking at non-goldfish tankmates for your goldfish you have to consider a few things like adult size, fin-nipping tendencies, and water parameters. Many livebearers such as guppies (Poecilia reticulata) share a lot of the same water parameters (cooler, hard, alkaline water), but they are small enough to be a goldfish snack. And they will be. Goldfish will try to eat anything that fits in their mouth. Personally, I believe that double-tailed goldfish should be kept with just double-tailed goldfish but others have had success keeping them with zebra danio (Danio rerio) and white cloud mountain minnows (Tanichthys albonubes). For the single-tailed goldfish your options are even more limited. They are a large fish to keep in home aquariums, but would do well with many of the same tankmates as the double-tails. In a pond you can keep koi (Cyprinius carpio) and single-tails together. These fish are closely related and share many of the same requirements. Mosquito fish (Gambusia spp) are another pond fish that can be kept with goldfish. There is some debate as to whether or not goldfish can or should be kept in typical tropical tanks. I do not believe this is a good idea for a few reasons, the first being that while goldfish can live at the higher temps in which tropical communities are kept, having them at these temperatures presents a few obstacles. First, at higher temperatures goldfish need to be fed more to maintain the same body weight. More food in means more waste out, and goldfish are messy enough as it is. Many tropicals don’t appreciate the large mess that goldfish make, and some of the more sensitive fish will succumb to it. Second, at a higher temperature goldfish take up more oxygen. Goldfish need a high level of oxygenation in the water, and the warmer the water gets, the less oxygen it holds. The other reason goldfish aren’t good for tropical communities is poor compatibility with most tropicals. Most fish typically chosen for tropical tanks like soft, acidic water, an environment in which goldfish will not thrive. Many are also small enough to become food or will see the long flowing fins as irresistible targets for fin-nipping. There are just too many complications that can come from keeping goldfish in a typical tropical tank, and I highly advise against it. 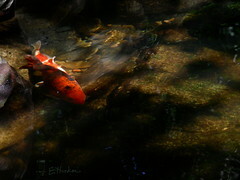 Most people have heard that goldfish will eat all live plants and will always uproot anything you put in the aquarium. While this does happen some of the time, if you are feeling adventurous you can try plants with your goldfish. Just make sure you have the right lights and lighting schedule. There is more to a planted tank than just throwing plants in there. I will give you some suggestions for plants with the understanding that more research should be done on planted tanks in general. Of the plants that other goldfish keepers including myself have had success with, the best have been the thick-leaved plants like anubias and amazon swords. I have also had success with fast growing plants like anarcharis and hornwort. It’s usually hit or miss with goldfish and plants. But don’t ever let anyone tell you it can’t be done. Plants are great for keeping good water quality (but won’t eliminate the need for a water change). One of the excuses I hear for someone keeping a goldfish in a one gallon (4 L) bowl or 10 gallon (40 L) tank is that “the fish will grow to the size of the tank.” This is false. It came about because goldfish kept in these small tanks often live in terribly dirty water. As a result of the poor water quality, they typically die anywhere from a few days to a year after they are purchased. The owner usually assumes that “it was the fish’s time anyway.” Due to these poor conditions the fish either grew just a bit or didn’t grow at all. The lack of growth in the small tank leads people to believe that “fish grew to the size of their tank” and then died when it got old. As we know from earlier, this isn’t true as goldfish live between 10 and 20 years and commonly grow 10 inches (25 cm) or larger. If the fish does survive this ordeal and is either placed in a larger tank by their owner or re-homed to a larger tank, the goldfish will suffer long term effects in the form of stunting. In anecdotal studies using juvenile discus, aquarists have shown that water quality has a greater stunting effect than being kept in a small environment. So if you are reading this and have just put a goldfish in an insufficient tank: there is still hope. Large, daily water changes will ensure good water quality until you can secure your buddy a larger tank. For those on a tight budget, try to look for secondhand tanks. With a life span comparable to a cat or dog, goldfish are a lengthy investment and may not be for every aquarist. Some people buy them and then learn about their care requirements. If you find yourself with goldfish you no longer want, do try to rehome them before you euthanize them. Many people see goldfish as throw-away fish, but they are not. They are a rather intelligent fish that will recognize the faces that feed them and be shy around new people. They feel pain, bond with their school mates, and show signs of grief when a tank mate is lost. A lot of people don’t like the ephemeral nature of fish, afraid that a child will be sad when his or her “fishy” dies. With a properly cared-for goldfish, that child won’t have to know loss so soon in life and will grow up with wonderful memories of taking care of “fishy” with mommy and daddy. "''Carassius auratus'' (Linnaeus, 1758)". Fishbase.org. Updated 15 Nov 2011. Retrieved 16 April 2012. Betty (Dataguru). 02 August 2009. “Goldfish Nutrition Part 2: Food and Nutrition.” theGAB.org. Retrieved 10 April 2012. Gay, Jeremy. 25 March 2010. “What do I need for goldfish?” Practicalfishkeeping.co.uk. Retrieved 16 April 2012. Hill, Nathan. 14 May 2011. “Goldfish with tropicals – wrong or right?” Practicalfishkeeping.co.uk. Retrieved 15 April 2012. Muha, Laura. 2006. “Fish Growth vs. Tank Size” in “The Skeptical Fishkeeper” column. Tropical Fish Hobbyist (December). 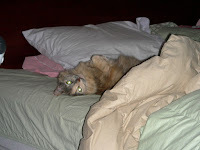 I publish this in the memory of my cat, Potpourri. While I wrote this article in the days before, I published it on the last night she was with us. She was sitting on my lap and purring. She always loved to watch the fish and had been my constant companion for 14 years. Gold fish is one of the most popular Aquarium fish around the globe.Goldfish were originally bred for and are best suited for outdoor ponds.They need large water space tank for their survival , if you want to have such fishes on your home, then made a big aquarium so that the goldfish will stay easily and also it is important to have good filtration system in an aquarium.